Plants, like animals, require oxygen to respire and perform basic cellular processes; however, some plants are able to survive in environments where oxygen is scarce. In salt marshes- coastal wetlands that are regularly flooded by seawater- plants like saltmarsh cordgrass (Fig. 1; Spartina alterniflora) and common cordgrass (Spartina anglica) must adapt to survive in low-oxygen environments. These environments are the consequence of oxygen’s slow diffusion in water, compared to air; once it is all used up for processes like respiration, it is not readily replaced. Consequently, salt marshes are often anoxic (or oxygen-free), which is not ideal for oxygen-required organisms like plants. Fig. 1. Spartina alterniflora or saltmarsh cordgrass lining the creek bank. This area is regularly flooded by salt water tides. Source: Ashley Bulseco-McKim. 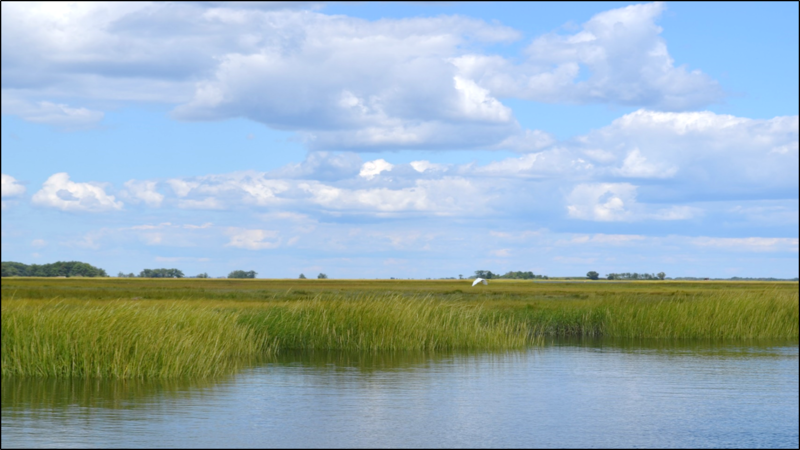 To survive in these regularly flooded areas, Spartina and other plant species have evolved a number of interesting adaptations. One is the development of internal tubes called aerenchyma that shuttle oxygen down to the roots, trapped in the water-logged and thus anoxic soil (Fig. 2). This area, called the “rhizosphere”, has higher oxygen levels than the surrounding regions, and plays a major role in many other biogeochemical processes. Fig. 2. A cross-section of the aerenchyma of a typical wetland plant that shuttles oxygen below ground to areas that may be anoxic due to waterlogged conditions. Source: Wikipedia. The rhizosphere refers to the narrow region of soil or sediment surrounding the plant roots that directly interact with those roots, both chemically and biologically. There are many, many resources that review the significance and history of the rhizosphere (for example, see here), but briefly: even though it covers a very small surface area, the rhizosphere is a hotspot for activity and is actually a very complex ecosystem, containing as much as 1 trillion microbial cells per gram of soil- that’s 1,000,000,000,000 per “smudge” of mud on your finger tip! These microbes are generally beneficial to the plant by providing essential nutrients like nitrogen, producing growth-promoting hormones that help the plant grow, and even suppressing harmful pathogens that may hurt the plant. While interactions between plants and microbes are complex (so much so that an entire field of science is dedicated to this very topic), it is clear that microbial activity can directly influence plant health. In turn, plant health can control which plant species grow and how much, thus affecting larger scale processes like photosynthesis. Since this micro-scale environment, hardly visible to naked eye, can have large-scale influences, it is important that we get a better understanding for how processes, like oxygen transport from the aerenchyma, affect the rhizosphere below. Fig. 3. An overview of plant-microbe interactions that occur in rhizosphere and bulk soils beneath a plant. Source: Coats & Rumpho 2014. There are several challenges involved with studying the rhizosphere, specifically, finding methods to make measurements without disturbing the small, yet distinct, regions that exist within the root-soil interface. To overcome this challenge, Dr. Ketil Koop-Jakobsen, a researcher from the University of Bremen, and his colleagues used an optode imaging system called VisiSens, which is simply an optical sensor device that measures a specific substance (see their paper here for a more detailed explanation). The benefit of using optical measurement instead of typically-performed physical measurements is that it does not disturb any gradients that have developed in the rhizosphere. Koop-Jakobsen et al. collected Spartina anglica rhizospheres and placed them in a “rhizobox”, which is essentially a plastic pot with an exposed side that allows for optical measurement of different parameters – in this case, pH, carbon dioxide, and oxygen. They wanted to know how oxygen concentrations changed over time and space within the rhizosphere, and in turn, whether this affected the dynamics of pH and carbon dioxide around the roots. This is important, because these small changes can have large consequences for both the plants and microbial communities. Fig. 4. Changes in oxygen, pH, and carbon dioxide concentrations throughout space for three different plants (each row represents a different plant). The white line across each plant root image (column 1) represents the region from where the image was taken (columns 2-4). Source: Koop-Jakobsen et al. 2018. The scientists observed very clear differences in oxygen concentrations around the individual roots, with the “oxygen zone” (represented by the orange color in Fig. 4) averaging a radius of 1.7 millimeters around the root (that’s less than 0.1 inch). Beyond this zone, oxygen falls to nearly zero (the dark blue color in Fig. 4). This result demonstrates two things: 1) how efficiently aerenchyma can shuttle oxygen down to the roots, and 2) how quickly this oxygen is used up within and beyond the rhizosphere. This increase in oxygen around the roots also coincided with decreases in pH (in other words, more acidic conditions) and increases in carbon dioxide. The authors emphasize that rhizospheres are highly dynamic regions, with clear differences among individual plants. Overall, however, there seem to be strong relationships between roots and the surrounding rhizosphere, through direct influence of oxygen, pH, and carbon dioxide concentrations at fine scales. This study clearly and colorfully demonstrates how rhizospheres can act as a hotspot for chemical and biological activity. Now that there are methods that allow scientists to study these regions, it is critical to better understand these patterns, how they influence (and are influenced) by the microbes around them, and how these patterns might change under different environmental conditions.